This unit has a 10 bar, LED display to indicate the sync. 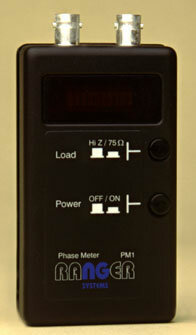 phase relationship between two video cameras. It provides a simple method of synchronising the field sync of two line locked cameras without the need of a dual-beam oscilloscope. Phase synchronisation is achieved whenever all LEDs are extinguished. A single switch provides selection of 75W/HiZ termination for both inputs.